The Fish Temple was originally an old “Water box” or Horsebox, which used to be flooded to allow a horse to stand in the water for health purposes. 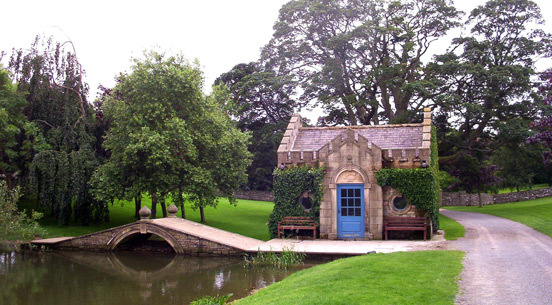 This building was altered in 1985 and given crenulations outside, and an ornate bridge which people can stand on and feed the many Mirror Carp and Chub in the ponds. Inside we have laid a mosaic floor, fitted osprey and fish light fittings and have designed furniture which was made and carved by Albert Jeffray. Another carving by Albert is ‘Aerial imprisoned In The Tree’ which made the most of an unwanted tree stump, he also carved a very nice Elm work surface in the reception area.